Ceilings installed in the hospital corridor. High-performance acoustic ceilings from Knauf AMF have been installed in one of the largest hospitals in the UAE, the Tawam Hospital in Al Ain, which recently expanded to offer additional specialist services. Thermatex Acoustic Medical ceilings have been installed in the wards, offices and consultation rooms. The high sound-absorbent properties of the ceilings improve the acoustics in the wards to help create a restful environment, according to Knauf AMF. 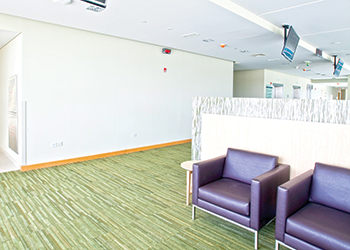 “Thanks to the high level of sound absorption and 38 dB sound attenuation provided by Thermatex Acoustic Medical ceilings, sound is reduced and greatly restricted from travelling through the ceiling void ensuring privacy in conversations,” said Sreejith Panicker, Knauf AMF, director – operations for the Middle East region. Thermatex Acoustic Medical is a 19-mm-thick perforated mineral tile which is suitable for healthcare environments. Its visible surface is covered with a white painted acoustic fleece with a high light reflection of 88 per cent which helps reflect natural daylight into the rooms, reducing the need for artificial light. “Areas with lots of natural light are known to increase the feeling of well-being. The ceiling tiles are fitted at the hospital using a concealed grid system which gives a sleek appearance. The tiles are fully demountable, allowing access to the void above the ceiling for maintenance,” he said. Thermatex Acoustic Medical satisfies a number of strict hygiene requirements. The tiles are manufactured with an anti-microbial treatment to repel bacteria and fungi growth on the ceiling. They have low air permeability, which helps prevent dust and dirt accumulating on their surface, reducing the risk of contamination. The ceiling offers high humidity resistance of up to 95 per cent RH which means that even in damp conditions and high temperatures the tiles remain stable. 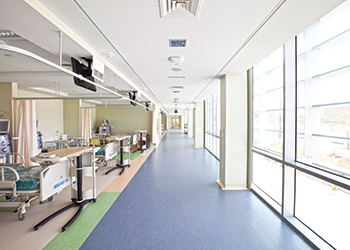 Thermatex Alpha HD planks are installed in the hospital’s corridors. The planks, which were installed using a free-span system with a concealed grid, are easily demountable so maintenance openings are not required for access to the ceiling void. Alpha HD is claimed to offer the highest sound absorption of NRC 0.85 plus 34 dB sound attenuation, which helps prevent unwanted sounds of voices, footsteps and trolleys moving on the hard floors in the busy corridors transferring through the ceiling void to adjacent rooms. This is particularly important in hospital design as the walls may not extend up to the soffit due to the busy service layout, said Panicker. The planks are durable with an attractive matt white surface providing 88 per cent light reflectance to help provide a uniform spread of light. They are available in different sizes up to 2,400 mm. “Both Thermatex Acoustic Medical tiles and Alpha HD planks meet the highest fire resistance requirements, providing up to 120 minutes protection plus Class A rating as per ASTM E84 in terms of reaction to fire,” he pointed out. Knauf AMF Ceilings manufactures its high-performance acoustic ceiling systems in the largest mineral fibre plant in Europe, which the company said, is one of the most modern factories in the world. Knauf AMF continues to innovate and develop new suspended ceiling products including rafts, baffles and acoustic wall panels, Panicker concluded.